Where are you from? Your profession? We live in Fleming Island, Florida, just south of Jacksonville. Suzanne is a dental hygienist. Mark is a retired US Navy carrier pilot who currently flies private jets for NetJets. When and how did you become interested in paddling? Mark started paddling about 12 years ago when he bought a small sit-on-top kayak to explore and fish while cruising his sailboat. Kayaking slowly became his main water activity and a source of great exercise. His obsession fully developed when he started building and racing kayaks. 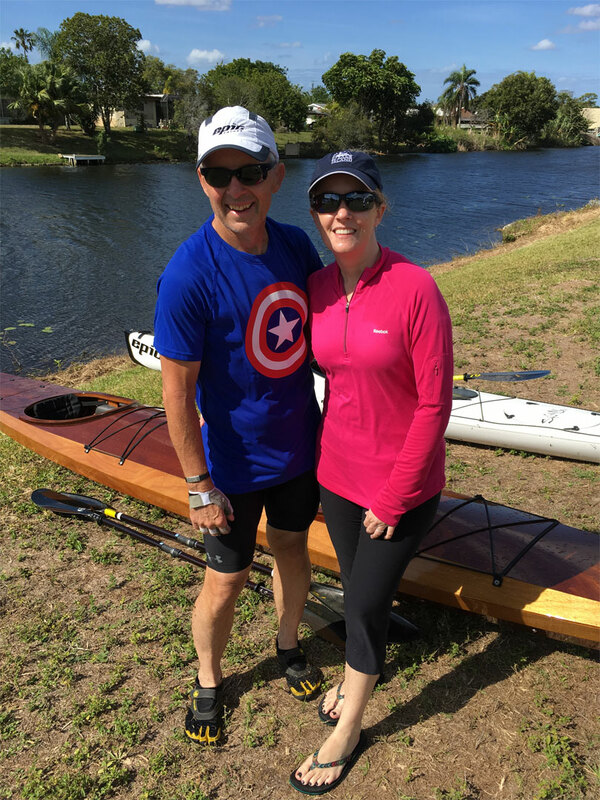 Mark introduced Suzanne to kayaking when they started dating about 10 years ago. Where is your favorite place to paddle? Although we have paddled some amazing places including Maine and Alaska, we still find the springs and rivers in the Ocala National Forest (Juniper, Silver, and Ocklawaha) to be our favorite paddling locations. We enjoy the remote location, natural beauty, plethora of wildlife, and of course the weather. Which Paddle Florida trips have you gone on? We went on the inaugural Flagler Coastal Wildlife Experience in November 2017. Can you describe a Paddle Florida trip highlight? The second day of paddling on the coastal Flagler trip was exhilarating because of the challenging conditions. Those of us who were able to make it through the strong wind and current around Fort Matanzas were pretty proud of ourselves. What advice do you have for folks considering a Paddle Florida trip? Two pieces of advice. First, if you are new to kayak camping, going on a Paddle Florida trip is a great way to start. They handle all of the logistics and food, so all you have to do is paddle and enjoy. Secondly, heed the boat recommendations that Paddle Florida provides for each trip. It is hard to enjoy yourself when you are struggling in a boat that is inadequate for the conditions.